After the medical incident killed seven dialysis patients in the northern province of Hoa Binh, health authority in Ho Chi Minh City asked hospitals to review the process. As per the department of Health’s document to facilities, medical staffs at the artificial kidney department in hospitals must follow the Ministry of Health’s guideline on dialysis process to ensure patients’ safety. Deputy Head of the municipal Department of Health Dr. Tang Chi Thuong said that medical institutions providing kidney dialysis services are requested to review their technical process, examine patients’ health condition, clean and test all their equipment in accordance with instructions from the health ministry on kidney dialysis to avoid medical complications. After seven out of 18 kidney patients receiving dialysis at Hoa Binh Province General Hospital died of suspected anaphylactic shock and ten of them were sent to Hanoi-based Bach Mai Hospital for further treatment, hospitals in HCMC have reviewed dialysis techniques and process. 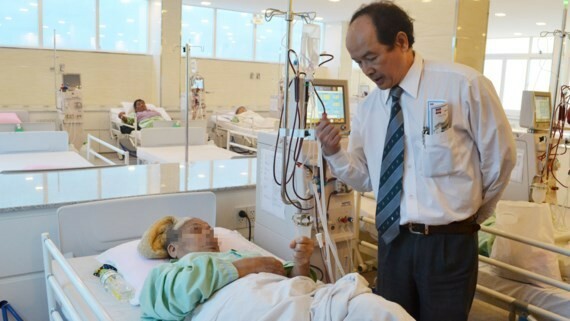 Dr. Luong Hoang Liem of a hospital in Thu Duc District said that the hospital has checked all dialysis process on 130 patients and 10 other patients in its satellite infirmary in Binh Chieu Ward. However, the hospital transferred dialysis patients in the satellite hospital to Thu Duc Hospital five days ago for patients’ safety. Nephrology and dialysis medical experts said that anaphylactic shock complication is likely to happen in dialysis patients with low rate. Importantly, medical workers must early detect and provide timely treatment. Prior to the incident, a patient’s heart with kidney failure stopped beating on dialysis process in Hoa Binh Hospital.